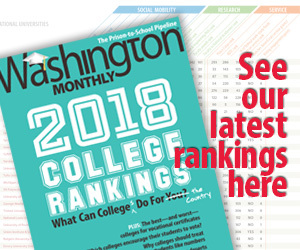 In North Carolina, which pioneered one of the nation’s most sophisticated accountability systems, more than 32 schools ranked as excellent by the state failed to meet Washington’s criteria for academic progress. In California, 317 schools showed tremendous academic growth on the state’s performance index, yet the federal law labeled them low-performing. ….In Florida, Gov. Jeb Bush announced that the state had rated more than two-thirds of Florida’s 3,100 schools as high-performing. But three-quarters were rated as low-performing under the federal law. Later on the story quotes some suburban parents who are concerned that labeling their local school a failure will cause their property values to fall. This might actually be amusing if it weren’t for the fact that labeling schools as failures isn’t an unexpected consequence of NCLB. In fact, it’s precisely the point of NCLB ? at least for some people. As I mentioned last year, NCLB mandates that each state has to set standards for student achievement, and by 2014 every single student must meet those standards. Any school with less than 100% success is deemed to be failing. What’s more, even in the period between now and 2014, while pass rates are “only” 80 or 90 percent and we’re still working our way toward the El Dorado of 100%, there’s an absurd concoction of thinly sliced categories mandated by the act, and failure in any one category marks the offending school as a failure. It’s pretty obvious that there are a suspiciously large number of ways to fail, and as the years go by the number of “failing” schools will slowly increase to 100%. I suspect that a lot of people who supported the worthier goals of NCLB simply didn’t realize they were getting snookered: the fact is that the Bush administration wants to see lots of public schools labeled as failures. It’s basically a long-term plan to erode the public’s faith in public schools and thereby increase support for private schools and vouchers. This is part of a pattern from conservatives, who realize that their domestic agenda is actually pretty unpopular and can be passed only if people don’t realize what they’re getting. NCLB is an example of this kind of stealth legislation, and both last year’s Medicare bill and this year’s “ownership society” are additional examples. In the end, though, NCLB may turn out to have been too clever by half, as parents rebel against being labeled failures instead of meekly accepting the verdict of the federal government. Of course, that’s not the only surprise the Bush administration has in store ? surprises that they’re hoping nobody will notice until they’re either safely reelected or out of office. As I wrote last December, 2010 should be a helluva year….